With the QUADRO, Aqua Computer presents a four-channel PWM fan controller with an outstanding range of functions that is equally suitable for water-cooled and air-cooled computers. An RGBpx effect controller for 64 addressable LEDs is also integrated. Eight further measured values can be transferred from the PC to the QUADRO via aquasuite software. aquabus interface: When connected to an aquaero, the fan outputs can be controlled via the aquaero. The four fan connections of the QUADRO can be configured individually and, thanks to the high output power of 25 watts per channel, also offer the option of connecting several fans to one output of the QUADRO via suitable splitters. In addition to manual adjustment of the fans, temperature-controlled operation is also possible. Both setpoint controllers and individually adjustable control curves are available for this purpose. Optionally, the connected fan can be switched off completely if the temperature falls below the set temperatures, or it can continue to be operated with an adjustable minimum line. An intelligent start boost function with monitoring of the speed signal can be activated for each channel to start the fans safely. All fan outputs are exclusively suitable for PWM fans with four-pole connectors and are protected against overload. 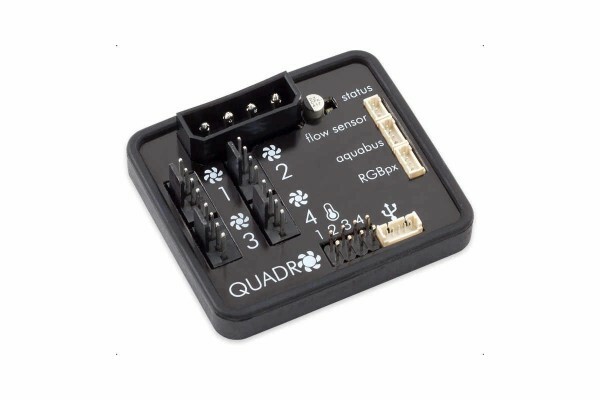 The QUADRO has an RGBpx output for individual control of up to 64 addressable LEDs. Each LED can be individually set in colour and brightness. A total of four LED groups of variable size can be configured, to which visual effects can then be assigned. The 23 available effects offer extensive setting options for further individualisation. Many effects also offer the option of modifying effect parameters (e.g. speed) depending on current sensor values. The available effects also include sound-to-light effects that react to the sound currently output by the computer. An outstanding feature is the AMBIENTpx effect, which allows the edge areas of the current screen content to be reproduced on the connected LEDs, thus creating a very effective backlight around the computer screen. As an alternative to the LED strips offered by Aqua Computer, Corsair and NZXT LED fans can also be used for lighting effects using the RGBpx Splitty4 product (item 53267, not included). In addition to use as an autonomous USB fan controller, the QUADRO can also be used as an aquabus extension for an aquaero 5 or aquaero 6. In this case, the four fan outputs of the QUADRO are available to the aquaero for the control functions. A maximum of two QUADRO expansion devices can be connected to an aquaero. Screen contents that prohibit an analysis by means of DRM or other measures cannot be evaluated. With this product you receive a license for the current and next annual version of the software. Please note that an Internet connection is required for the installation and activation of the software. Further information on licensing and activating the aquasuite software can be found here.